A previous staging of the Virgin Gorda Easter Fest. 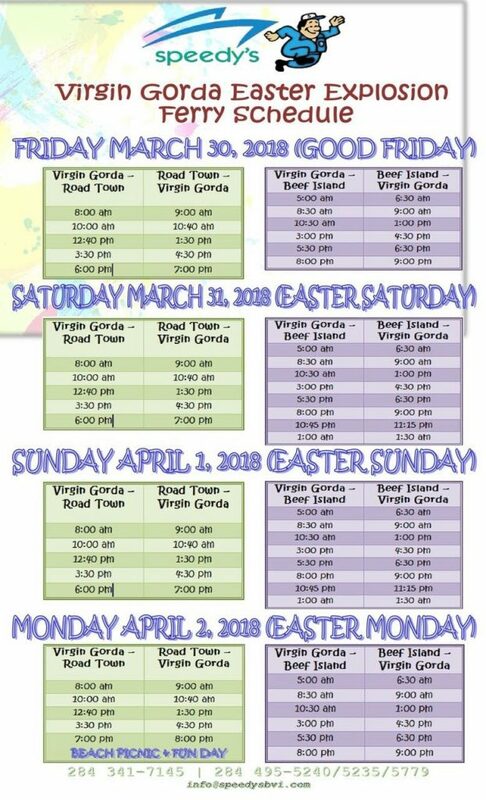 The Virgin Gorda Easter Festival kicks off today with the the Cultural Food Fair and Kids Day at the Little Dix Bay Field across from the island’s ferry dock. Today’s event will feature Leon and the Hotshots, Bamboula/Heritage Dancers, It’s A Secret, Final Faze, and Elvis White. The fair starts at 10am and ends at 7pm. On Sunday (April 1), Easter Fest will continue with the RT O’Neal Parade from The Valley Methodist Church to St Mary’s Anglican Church at 3pm. The Lion’s Club Easter Egg Hunt at Walter’s Recreation Park will follow the parade. Easter Fest will culminate on Monday with a beach picnic and family fun day at St Thomas Bay Beach from 10am to 7pm. The event will feature entertainment from VIBE, OMG, and Relentless. Food and drinks as well as a fashion show will also be part or Monday’s event. Speedy’s Easter weekend ferry schedule. Well look at what the BVI reached to because of lack of money and following other cultures down the path of immorality and inequity.